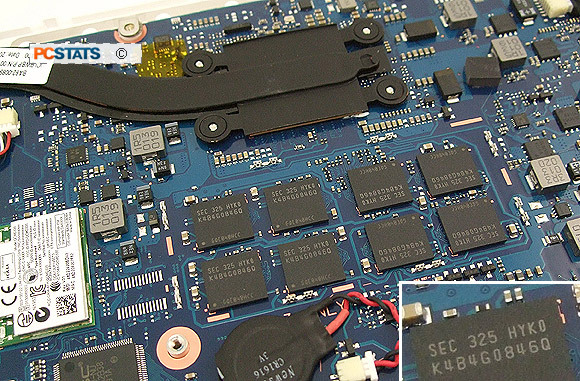 On the storage front, Samsung opt for a 128GB mSATA 3 SSD inside the Book 9-Lite NP915S3G-K01 notebook. The 128GB SSD is partitioned somewhat strangely; a 99GB primary drive and no less than four recovery partitions of 500MB, 300MB, 17.83GB and 1GB. 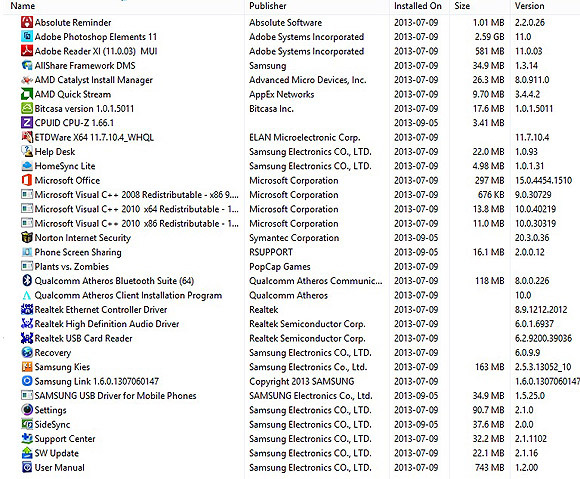 For a main hard drive, 99GB is not a whole lot of space these days, particularly once a few programs are loaded. 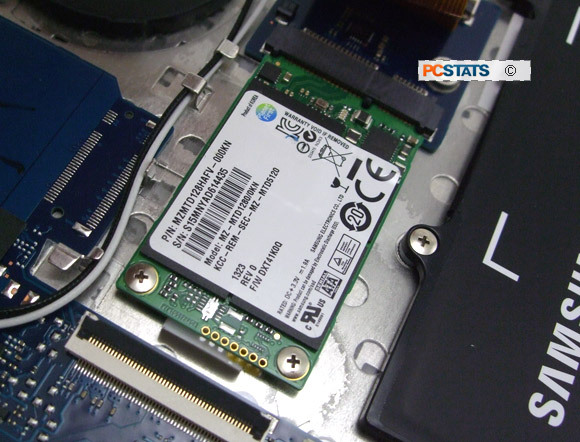 The actual 128GB mSATA SSD is manufactured by Samsung (part no. MZMTD128HAFV) and is the only part of this computer which can be upgraded or replaced by an end user. 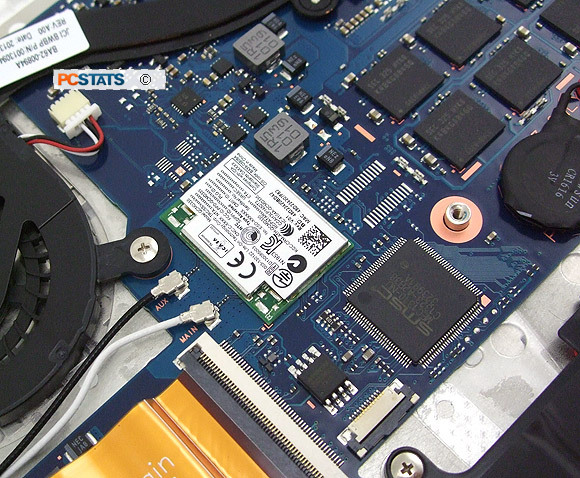 The SSD is accessed by removing the rear chassis cover to the ATIV Book 9-Lite. 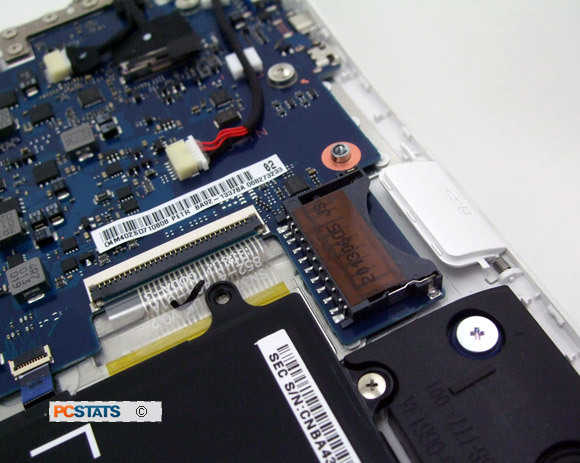 System memory consists of 4GB DDR3-1066 RAM which is soldered directly to the motherboard. I can see why Samsung would go this route to save space in such a compact notebook, but it really comes back to the ATIV Book 9-Lite being a near-tablet device. Samsung K4B4G0846Q memory modules are used. The integrated wireless module supports 802.11bgn and Bluetooth 4.0 standards. In the photo below you'll notice two antenna cables run off to the display panel where the antennas are located. 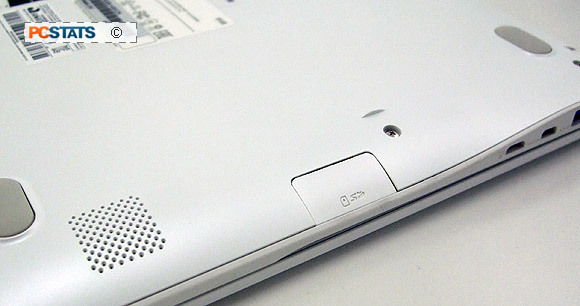 The ATIV Book 9-Lite uses a 1x1 antenna configuration. 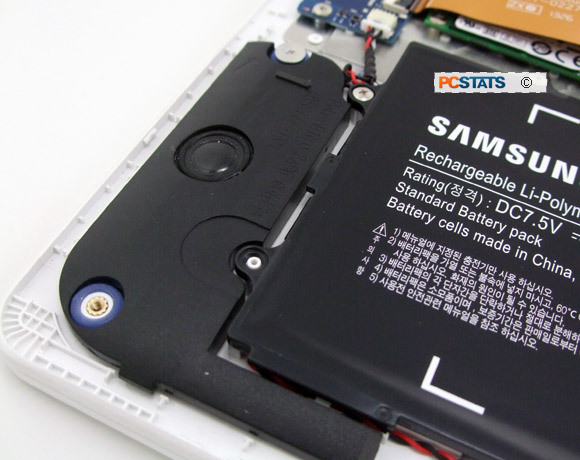 Being as slim as it is, the Samsung ATIV Book 9-Lite NP915S3G-K01 uses a fixed 2 cell rechargeable lithium polymer battery pack that's housed inside the chassis of the notebook. The battery is rated at 30Wh. Charge time is around 3 hours and battery life will largely depend on how the computer is used. 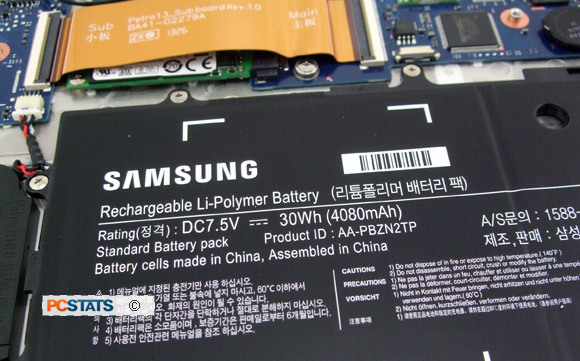 According to Samsung specs, battery life is about 5.5 hours under typical usage scenarios. On a side note, the Samsung ATIV Book 9-Lite NP915S3G-K01 is a generally well balanced notebook except when the screen is tilted all the way back; the notebook has a tendency then to want to flop backwards. Build quality is good, the chassis is made from glass fiber reinforced plastic and shows minimal flexing when held from a single corner. The 1.5W speakers are as 'bassless' and 'tiny' as you'd expect - no surprises there. Yey in a pinch or during a Skype call they'll get the job done. The speakers support 'HD Audio" and SoundAlive. On the underside of the Samsung ATIV Book 9-Lite NP915S3G-K01 is a 3-in-1 SD/SDHC/SDXC memory card reader hiding behind a small trap door. Here's a shot of the memory card reader with the bottom of the chassis removed.